In order to diagnose diseases such as malaria, African sleeping sickness, HIV and tuberculosis, blood samples are often placed in a centrifuge which spins the sample at extremely high speeds. This separates them into their components, or concentrates parasites or pathogens to facilitate further analysis and ultimately, diagnosis. Centrifuges are often not practical for use in remote areas where resources are limited. Of course, these are the areas where these diseases are often most prevalent. A barrier to the use of centrifuges in these rural areas is their high cost, heaviness and the fact that they require a source of electricity in order to run. This is a major barrier to developing diagnostic services for patients at the clinics they may visit in rural areas, and one that scientists at Stanford University sought to find a solution to. Manu Prakash is a professor of Bioengineering at Stanford, and concentrates on advancing developments in frugal science. He creates scientific equipment at accessible prices and his latest invention is a centrifuge which is cheap to produce and can operate without electricity. He saw an expensive centrifuge being used as a doorstop at a remote clinic in rural Uganda because there was no electricity supply with which to run it. Prakesh and his colleague Saad Bhamla then set about designing an alternative device, and the design is based on the whirligig, a classic kid’s toy. Whirligigs are a simple construction – and can be made by threading a loop of twine through the two holes of a button. As the ends of the twine are pulled apart, the button spins rapidly. Despite the simplicity of this toy, the physics behind it are complex, and it is this that Prakesh harnessed when creating his new hand-powered centrifuge. Other designers have worked on field-based centrifuges before, with designs based on egg-beaters and salad spinners. The efficiency of these has had limited success, due to their bulky design and low rotational speeds. They have been capable of reaching a maximum of 1,200 revolutions per minute, when a lab-based centrifuge operates at around 16,000 revolutions per minute. Prakesh’s design can reach speeds far, far higher than that, competing with expensive commercial centrifuges. Called the ‘paperfuge’, Prakash’s centrifuge is capable of spinning at 125,000 revolutions per minute, with theoretical speeds of 1,000,000 revolutions per minute. The paperfuge is human powered, is incredibly cheap to produce at less than 20 cents; and is extremely lightweight at two grams. The paperfuge’s design centres around two paper discs. It works by loading small volume samples into tiny tubes known as capillaries. These capillaries are then inserted into a holder which is located on one of the central spinning discs of the paperfuge. Once the sample is loaded into the holders, the two discs are attached together using Velcro. This acts as a safety cover for spillages and creating a streamlined surface in order to reduce air drag which would slow the spinning speed down. Importantly, all the materials used to create the original design are intentionally cheap and easy to obtain. 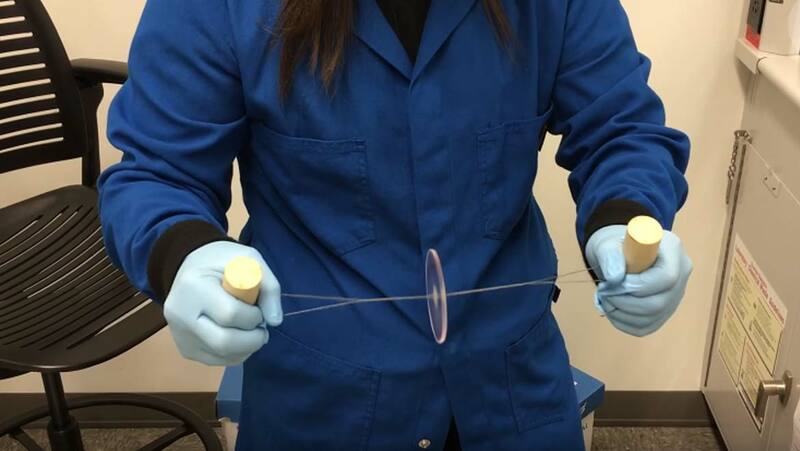 The two central discs are made of cardboard, braided fishing line was used for the strings in order to provide a high level of tensile strength, and drinking straws were used to create holders for the capillaries. Finally, the handles were made from wood or PVC plastic. Conventional lab based centrifuges offer a safe way to analyse blood samples, because the samples are contained within the centrifuge unit itself, thus reducing the risk of accidental exposure to the blood samples. Prakesh also incorporated safety mechanisms into the design of the paperfuge in order to minimise risk and allow users to operate it safely. The capillaries used are made of shatter-proof plastic as opposed to glass, and they are inserted into holders which are then sealed in order to contain any accidental leaks. Lastly, the two disc design acts as an additional safety measure. During laboratory trials into the separation of plasma from whole blood, the results obtained using the paperfuge compared very favourably to those using a conventional commercial centrifuge. The commercial centrifuge obtained speeds of 16,000 revlutions per minute and spun for two minutes, whilst the paperfuge spun at a maximum speed of approximately 20,000 revolutions per minute for a duration of a minute and a half. The commercial centrifuge used in this trial costs $700 whilst the paperfuge costs 20 cents. Trials were also carried out into the use of the paperfuge for malaria testing. For this, the paperfuge required spinning for 15 minutes. Again, the results were encouraging and indicated that the paperfuge could well be used as a diagnostic tool in areas with a high incidence of malaria. The team are now expanding their paperfuge to include devices made of a range of different materials including wood, plastic and polymers. Prototypes have also been made using a 3D printer. Potentially, these little devices could be manufactured in their millions and enable mass distribution to remote rural areas where disease diagnosis is vital but lab equipment is lacking.